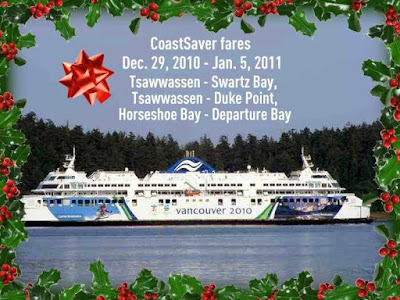 Between December 17, 2010 and January 3, 2011, one hundred and twelve extra sailings will be added between Tsawwassen and Swartz Bay, and eighteen additional trips between Horseshoe Bay and Departure Bay are scheduled. December 26 through 28 are expected to be the busiest days for ferry travel, particularly mid-day, over the holiday season. As heavy demand is expected on these three days, BC Ferries recommends reservations for customers planning to travel on a specific sailing. BC Ferries reminds passengers that on Christmas Day and New Year’s Day, sailing schedules are reduced on some routes due to historically low demand.